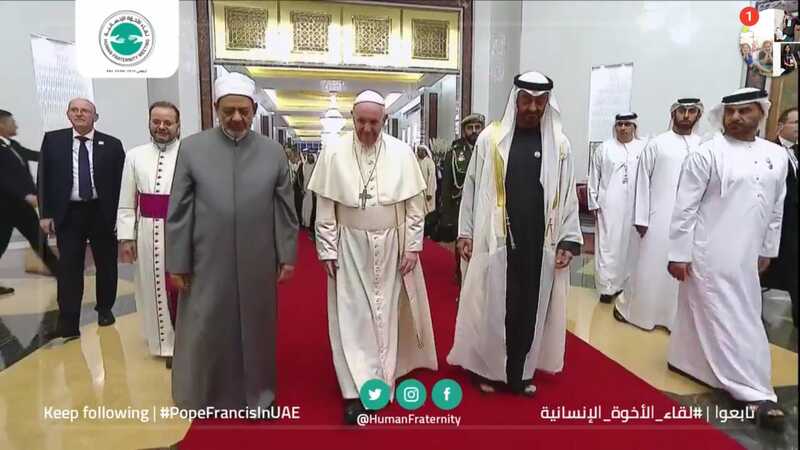 Abu Dhabi, UAE: Pope Francis, the head of the Catholic Church, has landed in Abu Dhabi and begins a historic visit to the UAE. Pope Francis, the head of the Roman Catholic Church, began a historic visit to the UAE on Monday when the Alitalia plane he was flying in touched down at 9.50pm at the Presidential Airport in Abu Dhabi. 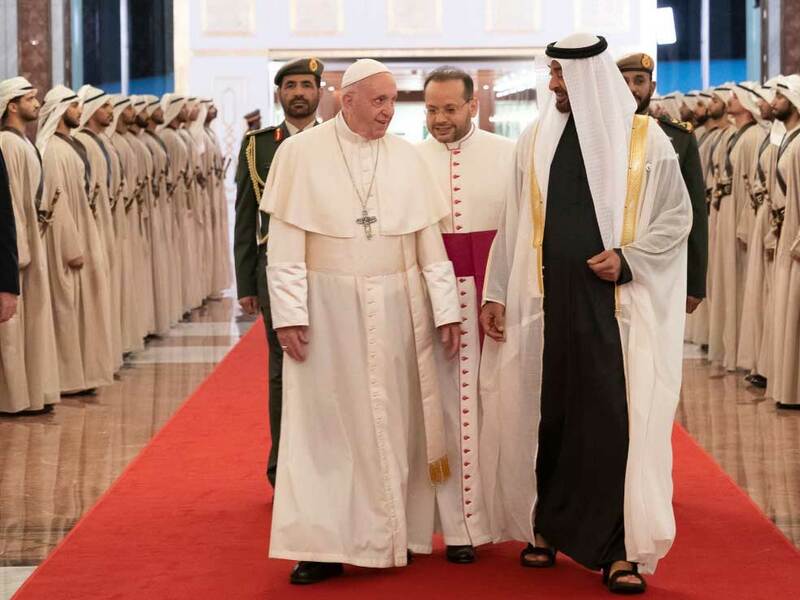 The visit marks a new beginning in relations between the UAE and the Vatican as Pope Francis become the first Pontiff to visit the Arabian Peninsula. Speaking to the media briefly on Papal flight AZ4000 from Fiumicino airport in Rome, the Pope said: "This morning I heard that it was raining in Abu Dhabi, which people there see as a sign of blessing." The 83-year-old pope has made the journey of about 4,700km on the invitation of His Highness Shaikh Mohammad Bin Zayed Al Nahyan, Crown Prince of Abu Dhabi and Deputy Supreme Commander of the UAE Armed Forces. Earlier on the Papal flight, Pope Francis went around meeting and shaking hands with all the journalists covering the Apostolic journey. He spent about half an hour speaking to everyone at the back of the plane. Over the next two days, a hectic schedule awaits the Pope. On Tuesday, he will be officially welcomed by Shaikh Mohammed. He will attend the Global Conference on Human Fraternity in Abu Dhabi along with the Grand Imam of Al Azhar, Ahmad Al Tayeb. On Tuesday, he will celebrate mass in Zayed Sports City Stadium where about 120,000 people are expected to attend. When the head of half the Christians in the world comes to greet you on the plane, you realise that the man in the white cassock is no ordinary person. For about half an hour on Sunday, Pope Francis went about talking patiently to every single media person on the plane. I had heard about the Pope's humility, but this was humility in action. When we boarded the Papal flight from Rome, we were told that the Pope would meet us, but never did I expect such a personal meeting. A clasping of the hand, a nod of the head, a smile which came from the heart and then he moved on to the next person doing just the same. This went on for about 30 minutes — a lot of time for an 83-year-old. 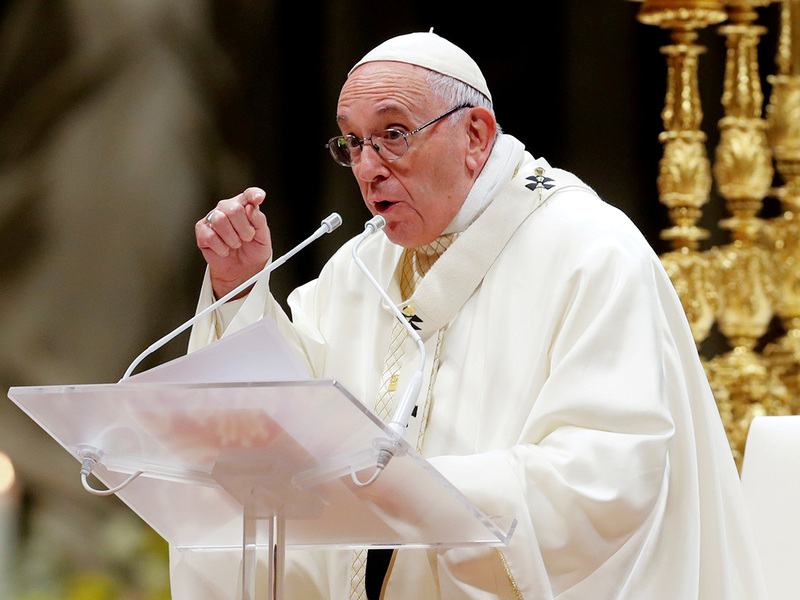 The Pope, who has taken his name from the Jesuit priest Francis of Assisi, has showed time and time again that true humility begins at home. Whether it be meeting prisoners, AIDS patients or the homeless, Pope Francis has given new meaning to the faith he practices. The head of the Roman Catholic church is respected by the leaders and members of all denominations because of his simple lifestyle. Over the next couple of days, we will wait patiently to hear him speak on tolerance and other issues. I am sure we will have plenty to learn. Abu Dhabi, the capital, is just about an hour away by car from Dubai, my home for the last 17 years. By all means, I groaned within, grab this rare chance to hear mass to be officiated by the pope himself. I was born, raised Catholic in one of the Philippine islands. At about the age of 7, I had befriended a Moro, a Muslim Filipino, on a ship that took our family to Mindanao from Luzon. That encouter taught me early in life: We, people who share the faith of Abraham, could share the same boat and arrive safely at our chosen destination. Those thoughts were long buried in my memory. This visit made me remember them now. In 1995, I had seen John Paul II draw up to 6 million people during his second and last visit to my country. The UAE’s culture of tolerance, its courage and moral leadership in confronting the voices of division and destruction have always fascinated me. My wife Tweet and I met at Dubai's St. Mary's Church, built more than 50 yeas ago on land donated by the Ruler, the late Shaikh Rashid. We sang in the Singles for Christ group. Got married in 2007. It was at St Mary's where we learnt about pilgrimages to the Vatican and the Holy Land, both of which we saved up for and grabbed when we found the chance. Between 2008 and 2013, we were blessed with three boys — Tobit Francis, Pietro Benedict and Topher Claren — names that all bear our affinity to the Church. 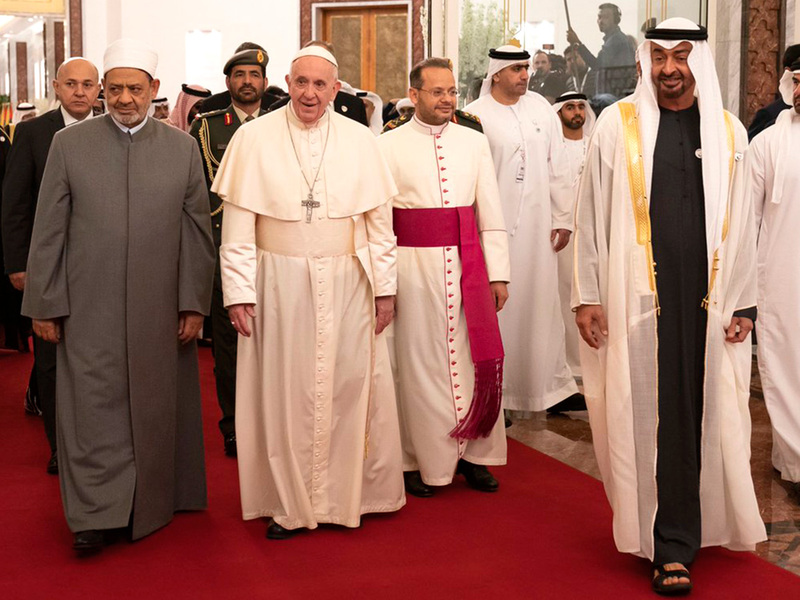 Today, I think about the significance of Pope Francis’ visit to the UAE: The warm welcome given by officials and its people, the dialogue between religious leaders hosted by Abu Dhabi, the blessings that God has bestowed upon this land. It’s almost unbelievable: For the first time ever, a pontiff, the “bridge builder” and successor to Peter, the prime among Jesus’ apostles, has set foot on the Arabian Peninsula — and at this time of the year. "It'll be a brief trip," the Pope told journalists. "They told me it's raining in Abu Dhabi. This, in some places, is seen as a blessing. Let's hope it goes this way." The great anticipation is palpable: From official pronouncements, vigorously covered by the local media, to stories of ordinary people preparing for the once-in-a-lifetime experience. I sorely want to be a part of that experience, too, even if time as a detached, objective journalist. In the run-up to this three-day visit, I’ve seen the build-up of excitement, the festive, almost electric kind. One may wonder: Why is this happening in the UAE at this time? The years I have stayed and worked in the UAE have never really jaded my sense of wonderment — about how the country has constantly changed, yet remained the same. I’m still fascinated by the United Arab Emirates, and how it marks 2019 as the Year of Tolerance. Where else in the world can you find a government with a dedicated Minister of Tolerance? I also wonder about what the pope might think or say in his homily…the gospel on Tuesday is about Jesus’ healing touch. The UAE is a land of peace, opportunity, solidarity with the world's neediest — including the millions of toddlers once threatned by polio. The UAE welcomes different tribes and tongues to its shores, where more than 200 nationalities live in harmony in these parts. Many people from other nations like me planned to stay here for a few years; but ended up spending almost a lifetime. The Pope’s visit is a natural extension of the generosity of the country, the world’s top donor per capita GDP for many years. The UAE, known for its world-class governance, innovation and tolerance, but also benevolence — freeing up prisoners by the thousands on a regular basis — is a model in every sense not only for the Middle East region, but for the rest of the world. I can't think of a better way, in dealing with offenders, to strike a balance between the need for correction and putting humanity into practice. And weather permitting, the Pope's Mass in Abu Dhabi will be a blessing for me. I am a sinner, and need God's ocean of mercy. Let the rain wash away my iniquities. This visit affirms my belief that the UAE is indeed a land of barakat, countless blessings. I feel that the Pope himself will be blessed by what he would see, feel and experience, just as surely as he will bless the people who welcome him in this land of Zayed and the children of Zayed. We're all pilgrims here on Earth. In the same celestial vessel, we sail on a journey towards a common destiny: finding joy in our shared humanity. And energised by the hope of a civilisation of love and mercy. Down here below and for all eternity. God bless the Pope. God bless the UAE.